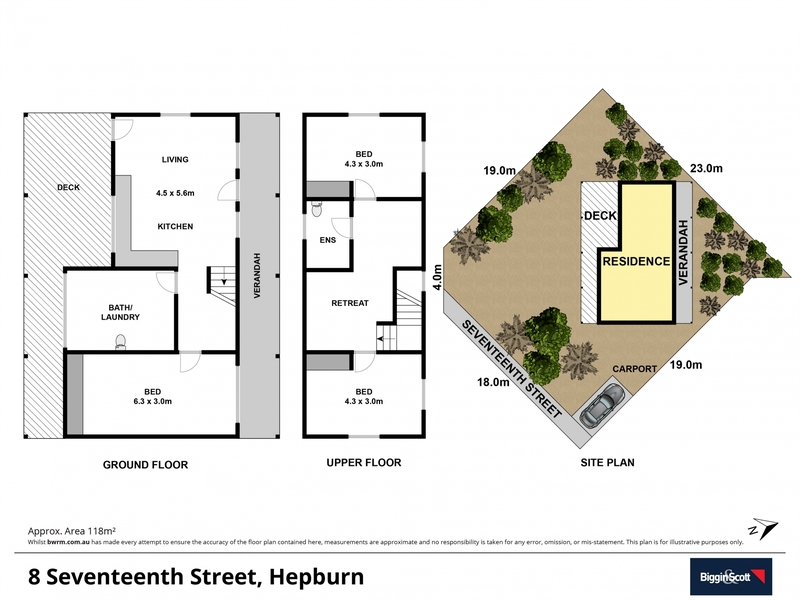 A gorgeous light-filled home offering stylish country living amidst lush established gardens, providing year-round pleasure and relaxation so close to all of the attractions of Hepburn Springs. Downstairs living comprises a spacious stylish kitchen and dining area, separate living room and large bathroom with laundry. Upstairs two bright bedrooms have high attic-style ceilings and attractive dormer windows with views to the nearby hills. There is a second bathroom with corner spa, and another sitting/study area. The long front north facing verandah and wide undercover deck leading from the kitchen are ideal settings for all day relaxing. This beautiful country retreat is located in a quiet residential area and suited to permanent living, weekender or rental investment. •	Corner allotment (Main Rd and Seventeenth St). Land size 459 sq.m.